Dynamics 365 Business Central is Microsoft’s leading solution for SMEs. It unifies ERP and CRM capabilities allowing you to run your entire business with intelligent applications that work seamlessly together in the cloud. It also integrates with Windows, Office 365, Power BI and PowerApps. It is the next generation of Dynamics NAV, one of the leading Microsoft business application products, which is serving 140,000 customers and millions of users worldwide. Dynamics 365 Business Central is an extremely flexible solution, easily adaptable to the needs of geographies, industries, and individual customers. One of the biggest improvements from Dynamics NAV is the user experience, it is built using the familiar Microsoft experience, offering clear navigation and intuitive design, we are impressed with how this looks. The use of insights and design, according to Microsoft, will significantly boost productivity when using the tool. 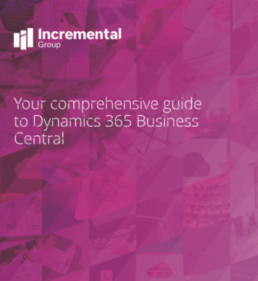 For more information on Dynamics 365 Business Central, download our comprehensive product guide today. We offer a full range of services to support you on your Dynamics journey including; implementation, upgrade and support. We support the full range of Dynamics NAV and Dynamics 365 Business Central. Incremental Group is a leading Dynamics 365 Business Central partner and has a dedicated team of certificed Dynamics 365 Business Central consultants to deliver projects and support for your organisations. We are a Microsoft Gold Certified ERP Partner with extensive experience in successfully implementing and supporting Microsoft Dynamics 365 for Finance and Operations (formerly known as Microsoft Dynamics 365 for Operations), Dynamics AX, Dynamics NAV and Dynamics CRM over the past 20 years. Our free demo and briefing will highlight the key functionality available from Microsoft Dynamics 365 Business Central, and demonstrate the areas relevant to your organisation. Over the 2 hours our certified Dynamics 365 Business Central consultant will provide an overview of the capability available, demo specific areas of interest and highlight the wider benefits available from Azure, Office 365 and the Power platform. Our assessments involves one of our fully certified Dynamics 365 consultants carrying out a review of your existing system, processes and requirements and designing a solution that meets your needs using Dynamics 365 Business Central. When looking to Microsoft for an ERP there are two options available; Dynamics 365 for Finance and Operations and Dynamics 365 Business Central. Our assessmentswill gather your requirements and submit a high-level recommendation for which solution will best fit your organisation. Take our easy online assessment. Simply answer a few questions about your organisation and one of our Dynamics 365 consultants will review your information, recommend a solution and provide additional information on the solution. We also offer an assessment directly with one of our Dynamics 365 consultants. We offer a free 1 hour discovery session and a full day assessment, each assessment will be followed up by a report that will include a recommended solution. Our 2 Day assessment will evaluate your existing instance of Dynamics NAV, your infrastructure, license requirements, customisations and create a plan to move you to Dynamics 365 Business Central. We have a number of prepacked implementation options to deliver Dynamics 365 Business Central with the capability your organisation needs. Our Team of Dynamics 365 consultants will work closely with your internal teams during the implementation to make sure your business processes, reports and requirements are delivered from day 1. We will implement Dynamics 365 Business Central for your organisation in just 2 weeks as part of our accelerated delivery approach. We will deliver core capability across; finance, operations, warehousing and sales & CRM. We will provide an expert team of Dynamics 365 Consultants and Project Management to deliver your new business application as quickly as possible. Our implementation covers all core modules including Power BI set up, go live and user training. We will implement Microsoft Dynamics 365 Business Central including Manufacturing for your organisation. This will be delivered by a dedicated team of D365 consultants. Our three-week implementation focuses on delivering value quickly by launching the core modules available in Dynamics 365 Business Central including the manufacturing module. We will provide an expert team of Dynamics 365 Consultants and Project Management to deliver your new business application as quickly as possible. Our implementation covers all core modules including Power BI set up, go live and user training. If you are using Dynamics NAV then we have a number of options to get you to Dynamics 365 Business Central. We offer an assessment where one of our Dynamics 365 consultants will come into your organisation review your system, processes and any customisations and design a new solution using D365 Business Central. Alternatively you can book one of our prepackaged upgrades where we migrate your data and set up all the core capability available Dynamics 365 Business Central. Incremental Group provide a range of dedicated support services, including a help desk for any issues or administrative support required. As part of our service we ensure your system continues to perform to a high standard, with regular reviews, training and proactive engagement if we see anything under performing. Our Support services are available for the full range of legacy Dynamics NAV and Dynamics 365 Business Central. We offer a range of additional services to help get the most out of your investment in Dynamics 365 Business Central. Incremental Group’s “Reporting with Power BI pack” is tailored to users of Dynamics 365 and built around your requirements to help you create clear and impressive business reports. In our 1 day workshop we will identify where you organisation would benefit from PowerApps, create a gap analysis, list your recommended PowerApps and build your first PowerApp as part of the day with your team. 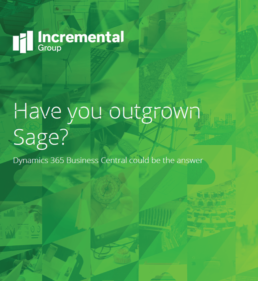 Dynamics 365 Business Central is designed for growing businesses that have outgrown their entry-level accounting solutions or legacy ERP systems such as Quickbooks, Sage or even Dynamics GP and older versions of NAV. These companies typically need more robust capabilities than the financial and accounting packages they started with but do not require to make a significant investment in a highly customised ERP system. What can Dynamics 365 Business Central do? Dynamics 365 Business Central offers capability across finance, operations, sales and projects. Please see our product guide for a more detailed walk through of what it can do. Dynamics NAV is a legacy product from Microsoft that is an on premise solution. Dynamics 365 Business Central is the new online service from Microsoft, updated capability, improved reporting, improved UI, built in intelligence and can be extended via third party apps (validated extensions) in Microsoft AppSource. Is there any Dynamics NAV functionality not included in Dynamics 365 Business Central? All of the capabilities that were available in Dynamics NAV are also available in Dynamics 365 Business Central. Dynamics 365 Business Central customers will receive service updates automatically as they become available (approximately one update/month). Customers on Dynamics NAV will have to follow the cadence of the Dynamics NAV releases. Are Dynamics 365 Business Central upgrades required? Dynamics 365 Business Central is a SaaS product and so customers will receive service updates automatically (approximately one update/month). Is Dynamics 365 Business Central a true SaaS/public cloud/multitenant offering managed by Microsoft? Yes. It’s a full online service managed by Microsoft on Microsoft Azure. The price per user includes all costs associated with running the software. It includes SQL, Azure consumption, backup/restore, availability according to the SLA, upgrades etc. It also accommodates for customisations not only in the form of ISV solutions that can be found on AppSource.microsoft.com but also customisations made per customer or tenant. Is Dynamics 365 Business Central available on mobile devices? Yes, Dynamics 365 Business Central mobile app is available in various mobile app stores. Is Dynamics 365 Business Central built on Microsoft Dynamics NAV/GP/SL? Microsoft Dynamics 365 Business Central is the latest offering from Microsoft Dynamics family of products that is based on the Microsoft Dynamics NAV platform and several other Microsoft technologies, including Microsoft Dynamics GP best practices. Is a Dynamics 365 Business Central trial available, and how long is the trial? Yes. You can sign up for a free trial from the Dynamics 365 Business Central landing page. Those who sign up for the trial can use the demo company (with demo data) for as long as you like. However, if you choose to set up a new company within the trial tenant (for example, to view their own data in the system), you will have access to the new company data for 30 days. However, you will be able to continue to use the demo company (with demo data) for as long as you like (no expiration). Will the on-premise support change for Dynamics NAV? No. The support on Dynamics NAV continues as is today with the same timetable for support, which will be phased out over time. Do I need to have an Office 365 subscription to use Dynamics 365 Business Central? Does Dynamics 365 Business Central include payroll? Dynamics 365 Business Central does not include native payroll capabilities; however, customers can continue using their payroll solution of choice and integrate with the payroll solution by leveraging apps available in Microsoft AppSource. How much is a license for Dynamics 365 Business Central? There are a number of license options available, all licenses are based on a per user basis and include all hosting costs etc. This covers almost all of the capability available in Business Central; invoicing, purchasing, purchasing order, management, resource management, budgets, finance, fixed assets, workflows, contact management, single inventory, advanced sales, advanced inventory, distribution, warehouse management, project management. Premium pricing is £75.40 per user per month. Premium covers all of the capability in essential but includes Service Management and Manufacturing features. In Service Management you can schedule service calls and set up service orders, and track repair parts and supplies. In Manufacturing, you can define shop floor resources and their capacity, schedule operations, pull production components, and execute production operations. Team members are add-on licenses you can purchase for users that just need limited access to the system. They can read and approve things, run all the reports and have access to the employee self-service. Can Dynamics 365 for Sales and Business Central work together? With Business Central, customers can process orders and finances and have seamless integration in the lead-to-cash process. When an application is set up to integrate with Dynamics 365 for Sales, the Sales data from Business Central is accessible and vice versa in some cases. This integration allows for working with and synchronizing data types that are common to both services, such as customers, contacts, and sales information, and keep the data up to date in both locations. For example, a sales person in Dynamics 365 for Sales can use the price lists from Business Central when creating a sales order. When an item is added to the sales order line in Dynamics 365 for Sales, this item is available also to see on the inventory level (availability) of the item from Business Central.